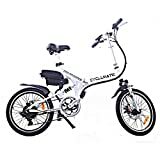 If you have a good look around the internet for cheap electric bikes you’ll undoubtedly come across the Cyclamatic ebike range, they have good reviews on eBay and Amazon, and are also available through several large retailers as well including Walmart (that’s Asda if you live in the UK) and Tesco. Of course, there are more refined and capable electric bikes available, but they are more expensive. So if you’re after a low budget electric bike, or you’re buying an electric bike for the first time and not sure what level of use you will get out of it, then one of the ebikes in the Cyclamatic range could be for you. Cyclamatic have conveniently numbered their electric bikes sequentially starting at the CX1 up to the CX4. And then there’s a couple of others, the GTE Pro Step Through model and a Fat Tire mountain ebike. So please see below a rundown of each model, its key features, specification and some comments on for whom it would be most suitable. The CX1 is a decent starter mountain bike with close to hybrid tyres, front suspension, disc brakes and 21-speed Shimano gears. 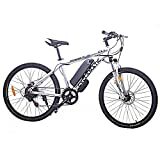 Weighing 20kg this is a relatively light ebike compared to others, however, the battery charge will only last around 25-30 miles which is lower than most in this class, but should be OK for most occasional leisure cyclists. Folding or ‘Foldaway’ ebikes are a good entry point for leisure riders and some commuters because they are come of the cheapest electric bikes available and don’t take up too much room. Conversely, they tend to have lower specification batteries than standard ebikes, which means less miles per journey, but they’re not really built for comfort on longer journeys anyway. The addition of mudguards and a derailleur are nice add-ons, as is a chainguard to protect your clothes from oil from the chain, and a suspension seat for added comfort. Battery capacity will give you 25-30 miles per charge which is more than enough for a small folding ebike. 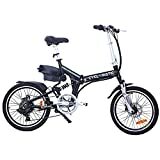 This is a very good value electric bike, highly competitive in its class. Another thing to mention is the inclusion of a 6-speed gear system which allows you to comfortably take on some cycling without motor-assistance. However, a downside of this bike is the weight at 26kg which makes it not as portable as you would like for a folding bike, but to find a light folding ebike you do have to pay quite a bit more money. The weight of folding bikes tends to be higher because the steel frame and folding mechanism have to be robust and high-density steel to ensure safety. To buy the Cyclamatic CX2 visit the product page on Amazon. The CX3 is, in fact, the CX1 with a slightly larger battery capacity, producing 30-40 miles per charge rather than 25-30 miles. The extra £60 price difference may be worth it for some cyclists who do longer journeys or don’t have the chance to charge their battery overnight between journeys. See the CX1 for specifications. Available in black or white, the CX4 is a folding ebike with more extras than the CX2. It boasts dual suspension, front and rear, and also a suspension seat, so if you’re not comfortable on this bike you may need to see a Doctor. To accommodate the rear suspension the usual battery slid in behind the seat post has been attached further up where a derailleur would be, so it’s unlikely you’d find a derailleur to fit this bike. The inclusion of mudguards and 6-speed gears are a welcome inclusion. The CX4 weighs just 20kg which is more manageable than the CX2. It has an expected miles per charge of 20-25. If you want a cheap electric folding bike with derailleur then you would be better with the CX2, but if the weight of the bike is more important than the CX4 would be the best option. Designed for female riders or older male riders, the GTE Pro has a step-through frame which makes mounting and dismounting the bike much easier. Some additional features such as front and rear electric lights, derailleur with under-mounted battery, front suspension, mudguards, suspension saddle, and 7-speed gears make this bike very good value for money. Weighing 27kgs the GTE Pro is a bit of a heavyweight, but it’s not the style of bike you need to lift onto a car rack for rides through the country, or up the stairs. If you do need something lighter then definitely consider the CX4. The battery specification is low on this bike, likely due to the location of the battery, having to be slimline, achieving about 20 miles per charge. For a daily commute or trips within town that may be enough, but if you want to do longer leisure journeys then consider a model with a longer battery life. Available to purchase on Amazon where it has a 4.7/5 star rating from customer reviews. If you’ve not seen a fat tire bike before the proportions may convince you you’re looking at a child’s bike, but in fact, they are full-size bikes with over-sized tires designed for off-road cycling. They’re as capable in the snow as they are on sand, and with the added electric motor can make an easy conquest of surfaces which would have been impossible on a bike previously. Fat tire bikes are about having fun, turning-heads and eating up terrain. The Cyclamatic Fat Tire ebike is well-priced, competitive in the market. It has 6-speed Shimano gears, disc brakes, and 5-levels of pedal-assistance. Producing 25-30miles per charge the 36v10ah Li-ion battery is average for an electric bike but maybe slightly under-powered for a fat tire ebike on off-road terrain, so expect a lower ‘miles per charge’ when o a steep or soft terrain. Can be ordered direct from Amazon.